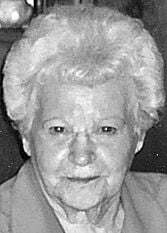 Roberta G. Haug, 93, of Kenosha, passed away peacefully on Sunday, July 29, at Rosewood Manor in Delavan, Wis.
Born on Aug. 10, 1918, in Langford, S.D., she was the daughter of the late Glenn and Lottie Holdridge. On Feb. 14, 1938, she married Karl Haug in South Dakota. He preceded her in death on Sept. 2, 1984. Roberta was employed as a sales person for JC Penny for 30 years. She was a member of Trinity Lutheran Church. She enjoyed to traveling, dancing and playing the organ. Roberta is survived by her three children, Carol (Milt) Ancevic of Delavan, Glenn Haug of Kenosha and Gary Haug of Racine; five grandchildren, Michael (Jennifer), Brian, Melissa, Derek (Lindsey) and Rachel; three great-grandchildren, Ashlynn, Jack and Griffin. She was preceded in death by her son, Larry, husband, parents and two sisters, Delores Newtson and Doris Roswald. Funeral services will be held on Friday, Aug. 3, at Trinity Lutheran Church at 11 a.m. Interment will follow at Sunset Ridge Memorial Park. A visitation will be held on Friday at the church from 10 a.m. until the time of service. In lieu of flowers, memorials to Trinity Lutheran Church would be greatly appreciated by the family.